The Parisians have a deep-rooted tradition. 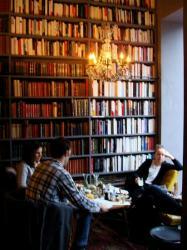 They love to hang out in the cafés, chating, meeting each others, drinking, scribbling and engaging in earnest debate. They have also developped an art of small talk. At least but not last, the cafe is a place where you can see and be seen, one of the favourite attraction of the Parisians. Added to this, you can meet by chance some friends that you haven't seen for a while, or even meet some new persons. The café is definitely a social attraction. I love this little café in the Marais. 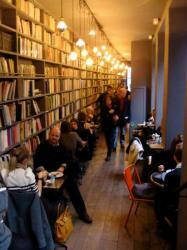 It is also a second hand book store, with several books on every kind of subjects in many languages. 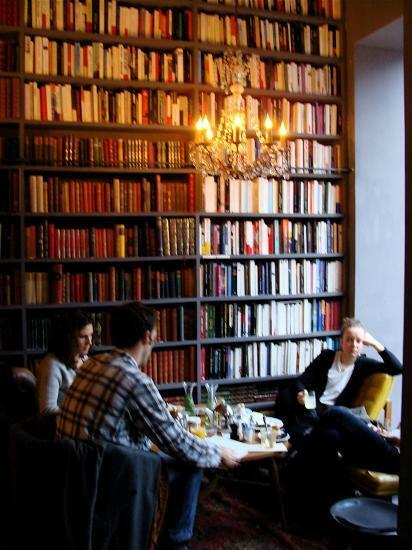 There is no order, so you find a book by chance, just sitting in a confortable armchair. The chandelier is the touch of glamour. Time spent in Paris may also lead you to realize that Parisians are not rude, they simply have more respect for people who are unnecessarily confrontational than for those who are meekly apologetic.